As I’ve mentioned previously, me and my son are big fans of the LEGO Architecture series. 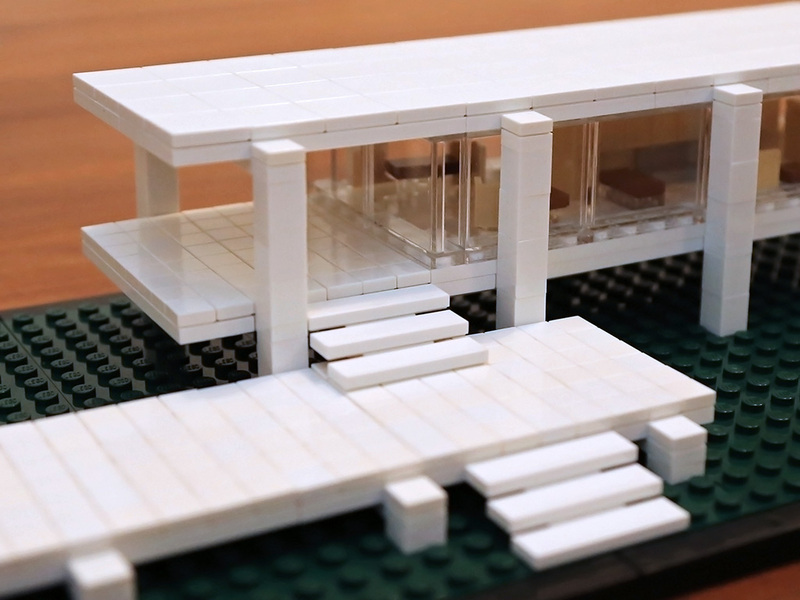 Our latest Architecture build was the 21009 Farnsworth House, a depiction of the minimalistic house Ludwig Mies van der Rohe designed for Dr. Edith Farnsworth some sixty plus years ago. Two things struck me as of note in this set. First one is the interesting reproduction of the interplay between the natural and the man-made, apparently so typical of Mies van der Rohe. In the LEGO version, the natural (grass in this case) is left studded, where as the man-made (exterior and interior of the house) is completely covered with flat tiles, contrasting the geometric building with its rougher surroundings. This may have been unintentional on the part of TLG, or merely the side effect of some cost-savings exercise, but the contrast works well nevertheless. Second note is the almost excessive use of the venerable 1×1 – be it in bricks, plates, flat tiles or corner panels ingeniously doubling as chairs. In fact, 60% of the 546 pieces are 1×1. This makes for at times tedious building, especially when trying to keep rows and rows of flat 1×1 tiles straight. All the 1×1 (and some 2×2) flat tiles do give the house a more tiled look than it has in reality, but in the end it is also a rewarding build and one of the better looking Architecture sets in my opinion. A bit fragile, though. P.S. We found the orange 630 Brick Separator helpful in straightening those 1×1 tiles. Use the blunt end to push edge tiles from the side, pushing two tiles at a time will straighten them both. Also, the flat end of the separator can be used to twist middle tiles.